We’ve already known almost everything about the upcoming budget phone Samsung Galaxy A2 Core, but we did not know the price yet, and some data were missing - so it's time to complete it. 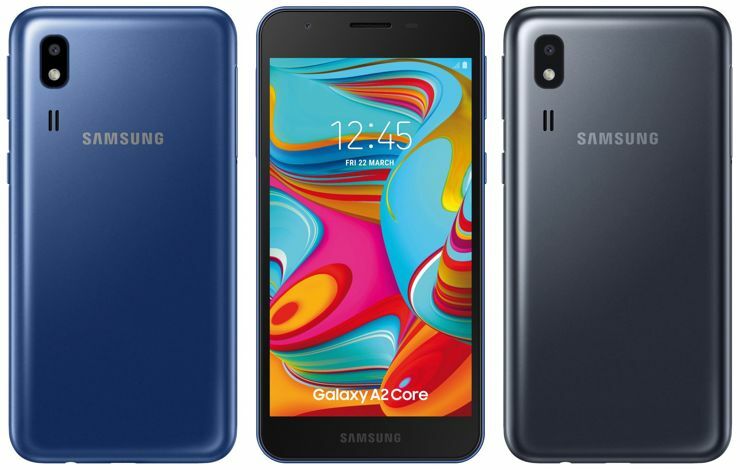 It is known that Samsung Galaxy A2 Core has Android GO, an Exynos 7870 processor and a gigabyte of RAM, as well as a 5-inch screen with a resolution of 540x960 pixels. We also knew the battery capacity (2600 mAh), there was also information about a 5-megapixel camera with a lens with a f/1.9 aperture. The front camera data was missing. And here is a small surprise, because it will also be 5-megapixels, like the back one. It will, however, receive a weaker lens with f/2.2 light. The equipment will also include 16 GB of internal memory. The unofficial data table also suggests that there will be three, not two, versions of the housing colour. The red version will join the already known black and blue. From previous leaks we also know the dimensions and weight of the phone (141.6 x 71 x 9.1 mm, 142 g), we also know that the A2 Core in the Dual SIM version has three separate slots for two nanoSIM and microSD cards, and in addition, all variants support LTE and also have Wi-Fi 2.4 GHz, Bluetooth 4.2, FM radio, minijack and microUSB. Today, we also got to know the price of the device for the Indian market. It is 5290 rupees, or 77 dollars. Source 91mobiles; viewed: 160 times. And now instead of Galaxy J, we will have the Galaxy A series, which will include already released on the market Galaxy A10, A20, A30, A50 and A70, along with another representative of the new series, which will appear on April 10 - of course, Samsung Galaxy A90. Today Samsung presented in Milan the flagship model from the Galaxy A series. Samsung Galaxy A80 is distinguished by its unique camera mechanism. In addition to the presentation of the flagship model Galaxy A80, the Milan launch of this year's Samsung Galaxy A smartphone family was also enhanced by Samsung Galaxy A20e and Galaxy A40 and already known models Samsung Galaxy A70, Galaxy A50 and A10. The Russian branch of Honor announced the launch of the Honor 8A Pro, which is an improved version of Honora 8A. Honor 20i will be presented on April 17, but now you can view it and reserve it in the company's store. The Realme brand belonging to Oppo is preparing a new model that will replace Realme C1, introduced earlier this year. Realme C2 should appear at the beginning of summer.